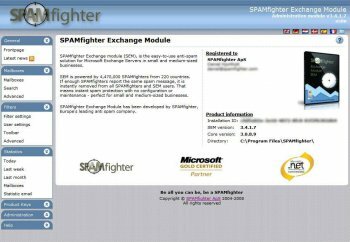 SPAMfighter Exchange module (SEM) is the easy-to-use anti-spam/virus solution for Microsoft Exchange Server 2000/2003/2007. SEM is powered by the SPAMfighter Server, which is updated by the SPAMfighter community of more than 4 million users across the globe. SEM delivers instant spam protection with no configuration or maintenance what so ever. SEM seamlessly integrates with Microsoft Exchange Server 2000, 2003 and 2007, making the solution very fast.